Visitors to the Bates-Scofield Home in Darien Dec. 10 experienced tours given by student docents. DARIEN — Cristina Escjadillo spent her childhood learning about world history at schools in Peru, Argentina, Brazil and Singapore. So it was a pleasant surprise to her when she moved to Darien in ninth grade and began learning about the richness of the town’s local history. 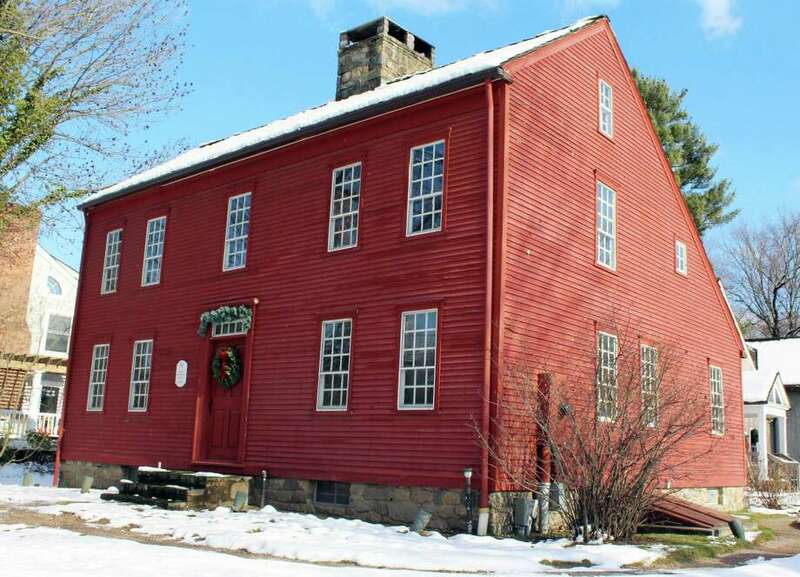 Escjadillo was looking for ways to get involved in her new community when she learned about the Darien Historical Society’s docent program where middle and high schoolers can sign up to give tours of the adjacent Bates-Scofield Home. Escjadillo decided to sign up and the 17-year-old Darien High School junior is now on her second year of giving tours. This year, Escjadillo is joined by seven other docents, the largest the program has seen according to Sarah Keena. For more information, visit darienhistorical.org. Any middle or high school students interested in joining the docent program can contact Sarah Keena at slkeena@aol.com. The student docent program began about eight years ago with Keena’s daughter who tagged along when her mother gave tours. For the past several years, Keena has had two to three docents. This year, the program expanded with five high school students and two students in middle school as Keena began to spread word of the program through history teachers at Darien High School. Keena said she tries to make the program as flexible as possible to encourage the students to stay involved. She tells the students the facts and it’s up to them to learn them and deliver them in an engaging way. About every six weeks, the Historical Society has a “student docent day” on a Sunday where students, clad in button-down shirts with skirts and aprons or trousers, give tours of the Bates-Scofield House. For Lauren Grandon, who just began the program, she’s found the trick to public speaking is to pretend you’re living in the Revolutionary War time period. “It’s trying to not memorize and state facts, but telling people what it would’ve been like and acting like you’re in that time,” the 14-year-old said. Grandon’s older sister, Emily, added that it’s a matter of presentation. The 16-year-old Darien High school junior recently joined the program with her sister. The younger sister, a freshman at Darien High School, said she hadn’t had much public speaking experience prior to joining the program but has found it’s not as intimidating as she expected. Most of the students in the program got involved out of a love of history. Chase Cleary, a junior at Darien High School, is even working on putting together a school history club, which will spread awareness about the town’s history. Even as a lifelong Darien resident, Cleary is still learning new things during her first several months in the docent program. “I had no idea about any of this which is why it’s been so cool learning where we came from,” the 16-year-old said. Cleary said she was especially surprised to learn about the secret drawers and passages the residents in the house used to protect themselves and their goods from pirates who came up the Long Island Sound. Many of the docents visisted the house while in elementary school but found the stories behind it resonate more now that they’ve returned as teenagers.